Child and Adult Food Care Program (CACFP) Provider Wanetta Gerlach of Moutville, PA featured by National CACFP Sponsors Association. Austin, TX, February 9, 2017	(Newswire.com) - ​​​​​Like many home care providers, Wanetta Gerlach started in the childcare profession as a way to work and care for her own children. Thirty-six years later, she is still finding joy every day in being a home provider. The smiles on their faces, antics during work and play, and as the children have lightbulbs of understanding combine to keep her motivated. Describing the twelve children in her home as super active, she knows nutrition is key to keeping them healthy. 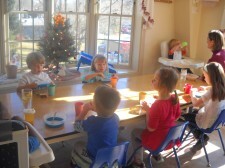 Everyone eats together where teachers serve as role models for the kids. Plates must be full of color! Wanetta focuses on making sure food is fresh and healthy. She involves the kids in preparing fresh fruits and vegetables to freeze for the winter. Being a firm believer of spending time in fresh air, Wanetta says opportunities to play outside are a must. Every day, weather permitting, the children walk to one of five parks in the area. Even when they're not at a playground, they run and roll on the hills at a local church having a fantastic time. They incorporate citizenship on their walks as ‘Trash Busters’ each armed with trash bags and gloves to pick up trash along the way. Rules to respect other’s property on their path are also enforced. In this child care environment, the children learn about communicating how to truly get along with respect towards one another. Teaching nutrition, health, and pre-k curriculum is only part of Wanetta’s focus. Her main goal is to provide a morally safe, sound environment where children learn about being good citizens and can get along in society.